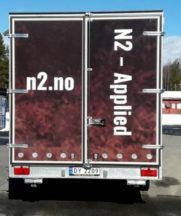 Thursday March 28th N2 kicked off European Road Tour 2019 with our mobile nitrogen fertilizer production unit. 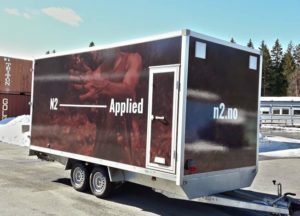 The trailer filled with N2s latest technology, is pulled by a car and behind the wheel we find Service Technician Joakim Ørjansen. First stop is Honkajoki, Finland. The mobile fertilizer production unit give us flexibility to drive around, demonstrate and engage stakeholders at an early stage. Joakim is on a mission, and he has curious and interested farmers on his list waiting for the trailer to arrive. 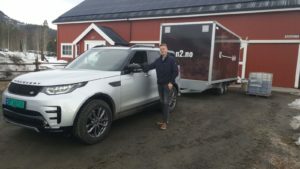 Joakim literally brings N2 innovation to the farm and demonstrates breakthrough technology on location. We have never tried this before, but we believe this set-up will enable us to visit more farmers and more countries during these hectic weeks leading up to the spring work in northern Europe and beyond. We enrich test batches of manure along the way for farmers to evaluate treated manure on their own fields, for their own crops, on their own soil with their local climate and temperatures. As long as the farmer has access to locally produced renewable electricity – primarily solar, wind or from biogas – N2 technology uses this green power to enable sustainable local production of nitrogen fertilizer and reduction of ammonia emissions from manure. We proudly introduce circular onfarm nutrient management. This spring – coming to you – with a mobile solution.